With a possible stellar companion in a wide orbit, this currently dim star lies about 63.0 light-years from Sol. It is located in the eastern part (18:19:50.8-1:56:19.0, ICRS 2000.0) of Constellation Serpens (Cauda or the Tail), the Snake -- west of Alya (Theta1,2 Serpens), northeast of Eta Serpens, east of Cebalrai (Beta Ophiuchi) and Gamma Ophiuchi, and north of the Wild Duck Cluster (M11) and M26. Based on proper motion and more recent radial velocity data from the HIPPARCOS space satellite mission, Gliese 710 is expected to come within 1.1 light-years (0.34 pc) of Sol in less than 1.4 million years, but previously, astronomers did not expect it to "perturb the Solar System's Oort Cloud sufficiently to create a substantial increase in the long-period comet flux at Earth's orbit" (García-Sánchez et al, 1999; and Weissman et al, 1997). According to new modelling calculations using additional data from ground-based telescopes which were published in March 3, 2010, Gliese 710 does have a 1 in 10,000 chance of coming within 1,000 AUs of Sol, which could significantly perturb the Oort Cloud, the Edgeworth-Kuiper Belt, and even slightly alter the orbit of Neptune (Vadim V. Bobylev, 2010; and Rachel Courtland, New Scientist, March 15, 2010). At its closest approach, Gl 710 will rival the brightness of the red supergiant Antares, although it is currently not even visible to the naked eye of Earth-bound Humans (more at Astronomy Picture of the Day). Many astronomers now refer to this star as Gliese 710 by its designation in the famous Gliese Catalogue of Nearby Stars (CNS, now ARICNS database) of Wilhelm Gliese (1915-93), who was a longtime astronomer at the Astronomiches Rechen-Institut at Heidelberg (even when it was at Berlin). As Vys/McC 63, the star's similarity to a red dwarf was noted by Alexander N. Vyssotsky (1888-1973) around 1942 using Leander McCormick Observatory objective prism plates (Alexander N. Vyssotsky, 1943). The star was first designated as BD-01 3474 in a catalogue that was originally published in 1863 by Friedrich Wilhelm August Argelander (1799-1875) on the position and brightness of 324,198 stars between +90° and -2° declination that were measured over 11 years from Bonn, Germany with his assistants Eduard Schönfeld (1828-1891) and Aldalbert Krüger (1832-1896). The catalogue became famous as the Bonner Durchmusterung ("Bonn Survey") and is typically abbreviated as BD. It was later expanded and extended during the early 20th Century with the Cordoba (observed from Argentina) then the Cape Photographic Durchmusterung (observed from South Africa). 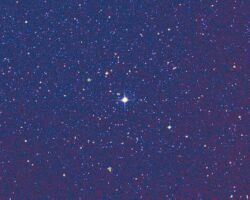 Gliese 710 is a relatively dim, main sequence orange-red or red dwarf star of spectral and luminosity K5-M1 V (NASA Star and Exoplanet Database; ARICNS; Joy and Abt, 1974; and Upgren et al, 1972). 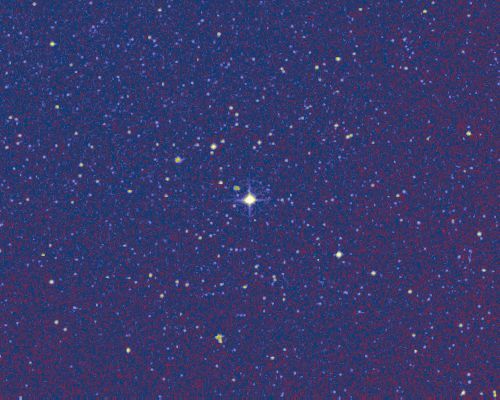 The star may have about 0.4 to 0.6 (possibly 42 percent) of Sol's mass (García-Sánchez et al, 1999; and Weissman et al, 1997), possibly 67 percent of its diameter (Johnson and Wright, 1983, page 691), and only 4.2 percent of its visual luminosity. It is not a strong radio emitter. However, Gliese 710 is a variable star with the New Variable Star designation NSV 10635. Some other useful star catalogue designations include: Gl 710, Hip 89825, BD-01 3474, HD 168442, HD 168442, U449, and Vys/McC 63. To be warmed sufficiently to have liquid water at the surface, an Earth-type rocky planet would have to be located relatively close to Gliese 710. Since this red dwarf star is so cool and dim, its habitable zone may be located somewhere beyond 0.2 AUs. At that orbital distance around a star of 0.4 Solar mass, such a planet could an orbital period more than 50 days. According to García-Sánchez et al (1999), astrometric residuals in early proper-motion measurements suggested a possible periodicity of 4.7 years (around 1,700 days) but its significance was uncertain (Grossenbacher et al, 1968; and V. Osvalds, 1957). Subsequent speckle interferometry failed to detect a stellar companion (Blazit et al, 1987). Morever, later HIPPARCOS astrometric data also failed to show any evidence of nonlinear proper motion over 3.4 years of observation. "In addition, it can be argued that it would be unlikely for an unseen main-sequence companion to produce the suggested drift of about 10 km s-1 over 50 yr. Such a companion could not be more massive than about 0.3 or 0.4 M, otherwise its spectrum would have been seen and it would have been detected by the speckle observations. However, a circular orbit for such a companion with a period of 100 yr would produce a velocity amplitude of at most about ±6 km s-1. One way to get a larger velocity amplitude would be to invoke an unseen evolved remnant for the companion, such as a massive (but cool) white dwarf. But then the astrometric motion of Gl 710 would have to be large, on the order of 1 amplitude for the full orbit. For an orbital period of 100 yr, the motion during the Hipparcos mission would hardly have departed from a straight-line segment, but it would have been absorbed in the proper-motion measurement. This would require that the orbital motion of Gl 710 just happened to cancel out the space motion of the system at the time of the Hipparcos mission. However, the proper motion was also measured to be very small by Vyssotsky (1946), and therefore the orbital and space motion would also have cancelled 50 yr ago. This is not consistent with supposing that the system was in a significantly different phase of its orbit, as would be required to explain the radial-velocity difference. Another way to increase the velocity amplitude would be to invoke a shorter period orbit, but this too would also be difficult to reconcile with the observations." Hence, García-Sánchez et al concluded that while Gl 710 does not appear to be a binary based on available data, "additional monitoring of the radial velocity and/or astrometric positions over the coming years or even decades is needed to settle this issue." The following star systems are located within 10 ly of Gliese 710. Up-to-date technical summaries on Gliese 710 can be found at: Astronomiches Rechen-Institut at Heidelberg's ARICNS, and the NASA Star and Exoplanet Database. Additional information may be available at Roger Wilcox's Internet Stellar Database. Constellation Serpens is composed of two parts: Serpens Caput (the Head of the Serpent) and Serpens Cauda (the Tail). Separating them is Constellation Ophiuchus, the Serpent Holder. For more information on stars and other objects in this Constellation, go to Christine Kronberg's Serpens. For an illustration, see David Haworth's Serpens.